We had to sadly say goodbye to Jane at Tanjung Gemok who had a bus booked to take her back to KL at 2pm. And after a KFC and a much-needed seat in their air-cooled restaurant, we boarded our next bus and departed on time at 5pm. 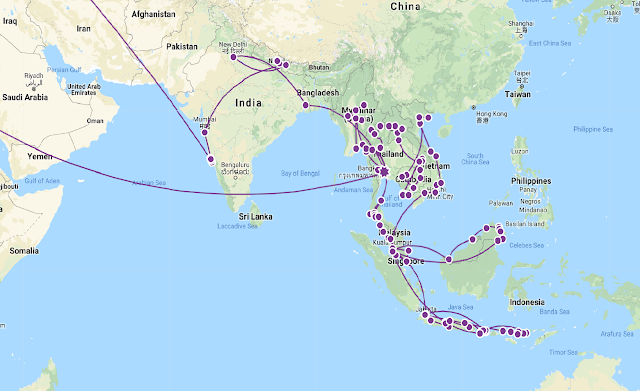 The journey time is scheduled for approximately 5 hours, but as this includes a border crossing, we reached the Malaysian border a few hours after setting off. The process is that the bus pulls into the drop off area, then everyone gets off with all their luggage, go through immigration and then back onto the same bus at the other side. Leaving Malaysia was the easy part, it’s just a quick show of your passport, get stamp and off you go. The bus then drives across the causeway into Singapore, and then you must do the same again to enter, but the driver advised he would only wait 30 minutes and then the bus leaves… This is where our journey went a bit wonky! We got into the Singapore immigration and customs are, got our 90-day visa and then headed for the luggage scanning area. I was ahead of Sadie and when I collected my bags at the other side, an official asked if I had any cigarettes in my bags. After showing him the opened sleeve which had 7 packets left, he advised me that I was not allowed to enter the country without declaring any tobacco products and would need to surrender them or pay duty on them. As I had got them in Langkawi (Duty Free island) I knew they only cost a few pounds, so told him I would just leave them and carry on my way. Sadly, this is not how it works, and he pulled me over to an office to ask a few questions and fill in some paperwork. Fine I thought, but he then advised me I would need to go to speak to a customs official too, and they would decide what would happen. This office was busy, full of tourists who like me were probably unaware of these regulations, and just before I got passed over to customs, I noticed out the window that Sadie was being marched over too. It was only then I remembered she had 5 x 50g packets of tobacco that Jane had brought over from the UK, oh well we would both be going to see the customs staff! After about a 10-minute wait, we both got taken round together to another office escorted by a member of security and the paperwork with the cigarettes and tobacco. We then got spoken to by the customs officer who explained why we were there, what we have done wrong and what could happen. As we hadn’t declared them, we were technically smuggling these goods into the country and could face a huge fine, thankfully he took pity on us and decided to give us a warning. Great we thought, we would still have time to catch our bus… except he now had a load of paperwork to fill in and as time ticked by and I asked if this would take long, he advised about another 30 minutes and our bus wouldn’t wait. They must be used to this on a regular basis, however it didn’t help us as we realised our bus would be gone, I asked to go to the toilet and had to be escorted there by one of their staff, talk about being treated like a criminal… ok so maybe we were technically smugglers! With all the paperwork done, and him even telling Sadie she could have been fined over $1000, all that was left to do was to watch the guy destroy all our tobacco and then sign some forms and we were free to go… guess it could have been worse than loosing £30 worth of tobacco, oh and the £15 taxi fare it cost us to get to the hotel! We had no local currency and there was no ATM at the border crossing, so we had to get a taxi that luckily took card and we got to our hotel about 10pm. The room we had was like a big cupboard, Singapore is very expensive for hotels and being on a budget, this was the best we could get. It wasn’t too bad, it was pretty clean, had air-con and a TV… just not a lot of room but we wouldn’t be in there much anyway. Infact we headed straight out to find an ATM (at 2nd attempt) and then eventually got a well-deserved beer before calling it a night. So, we had 3 full days in Singapore, and with so much that we wanted to see and do, we got up and about early (unlike us) and went for breakfast at a place called Two Bakers which was just near our hotel. As mentioned, this city isn’t cheap and neither was the breakfast, but it was delicious. We luckily picked a location which was near 2 MRT stations, so getting into the centre and all over was very easy. But we decided to walk for starters, heading to Little India. As we got closer, we noticed a lot of the roads closed off and police etc all about. Then we noticed huge crowds of people lining the streets, and on asking someone, it turned out there was a huge celebration going on near a famous 19th Century Hindu temple. 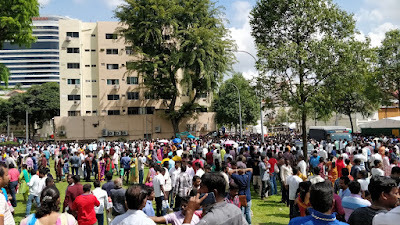 We couldn’t get near enough to see what was going on, and after a random Indian man gave us a bottle of water each, we decided to retreat to a nearby mall to cool off a bit. After struggling through the crowd, we got to the mall and went for a walk round. 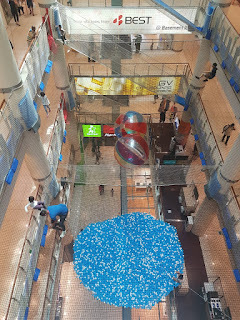 What caught our eye was a massive aerial playground, with nets, ball pools, slides and other fun things which was all suspended from the void between the mall floors. It looked like great fun, but sadly it was for kids! We took a walk through the streets of Little India but the temple I wanted to see was closed, so we then found the nearest station to our next destination. The cheapest way to travel is on the MRT using a travel card, similar system to the Oyster in London so we got our cards and off we went on the short journey to Chinatown. 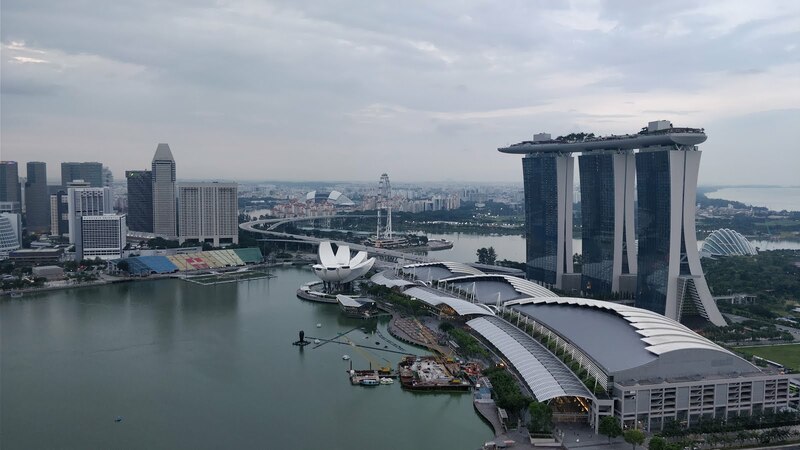 I must say that the transport system in Singapore is amazing, the trains are fast, regular, clean and the stations although soulless are practical and plentiful and it’s easy to get pretty much anywhere in the city quick. They are expanding it all the time and it seems that the government are willing to spend to improve things all over, take note UK. As soon as we got off the train at Chinatown, we felt the heat of the mid-afternoon sun so it was straight to the first pub we seen. A few pints later, we walked through the markets with their amazing smells and the streets with fantastic architecture. 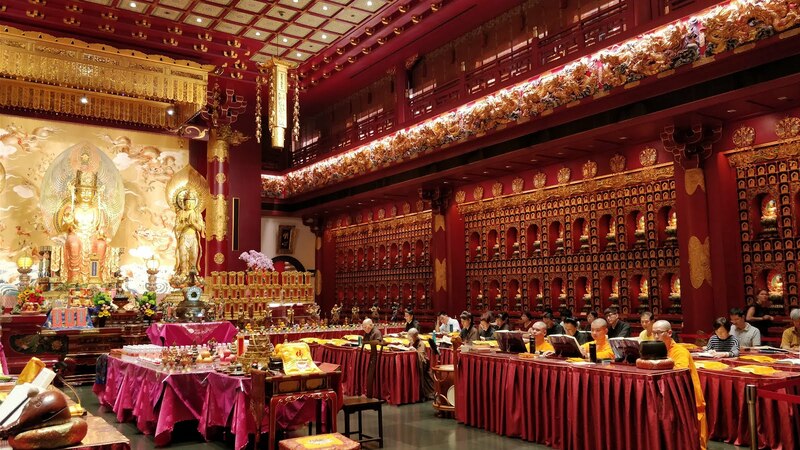 A highlight of the afternoon was a visit to the Buddha Tooth Relic Temple, and whilst it isn’t an old building, it had character and over 5 levels to explore. 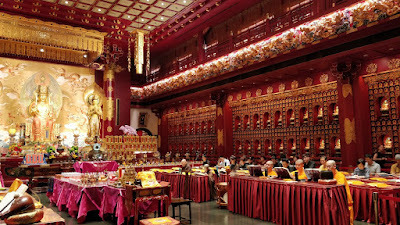 And as soon as we entered, there was a full hall of people doing Buddhist chanting which we watched for a bit. 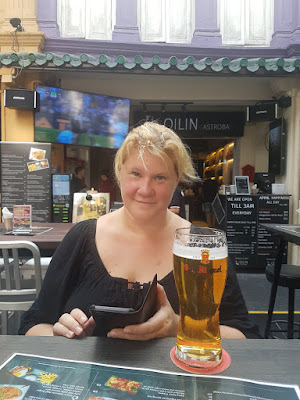 We then went a walk to see the quays, starting at Clarke Quay where we grabbed a quick beer, then walked along through Boat Quay. These are both historic areas that have been rejuvenated with shops, bars, clubs etc and all seem to be in competition with each other resulting in happy hours right along the waterfront. After that it was a stroll along towards Level 33, which is rooftop bar with seemingly the best views of the bay. It is also a craft brewery, who claim to be the world’s highest urban brewery. So up we went, managed to get a seat and ordered a couple of drinks. It isn’t the cheapest pint we have had, but the views over the bay, the gardens and surrounding area made up for that. It was daylight when we got up there, sadly too cloudy to see a decent sunset, but it was spectacular watching dusk fall and all the surrounding lights come on around the bay and in the gardens. We planned to go to the gardens to watch the free ‘Garden Rhapsody’ show they put on twice, but we ended up getting another drink, then heading over later to the 2nd show of the evening. This involved a walk down to the bay, through the huge multi-level mall which even had a river with boats running through it, then through the Marina Bay Sands hotel (one of the world’s top hotels) and then into the gardens at the other side. We made our way into the Supertree Grove just in time to find a spot, lie on the ground looking up at the trees. It soon burst into audio/visual spectacular for around 15 minutes the trees sparkled and the surround area lit up to the music. We were both very impressed, and after watching it all, we headed back to the hotel, stopping at a street food market for some dinner, realising we had been out and on the go for over 12 hours. The next morning, we got the MRT to Fort Canning, which is a historical park in the middle of the city, so we spent a while walking round there looking, then took a walk down past Raffles Hotel. The thing to do in the city is to visit Raffles, get a Singapore Sling in the Long Bar and throw monkey nut shells on the floor. Sadly, we couldn’t do any of that as the whole hotel is closed for refurbishment for the next few months, so we just had to walk around it instead. We could have gone into the ‘pop-up’ Long bar they have built next to it, but decided against paying about £18 for a cocktail when it isn’t even the real deal! 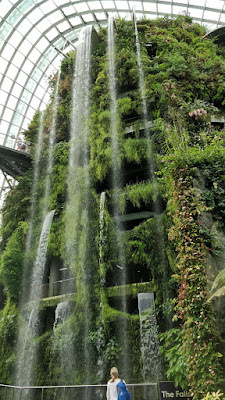 For the afternoon, we had planned to spend most of it back at the Gardens In The Bay, and so we headed back there to visit the Cloud Forest and Flower Domes. 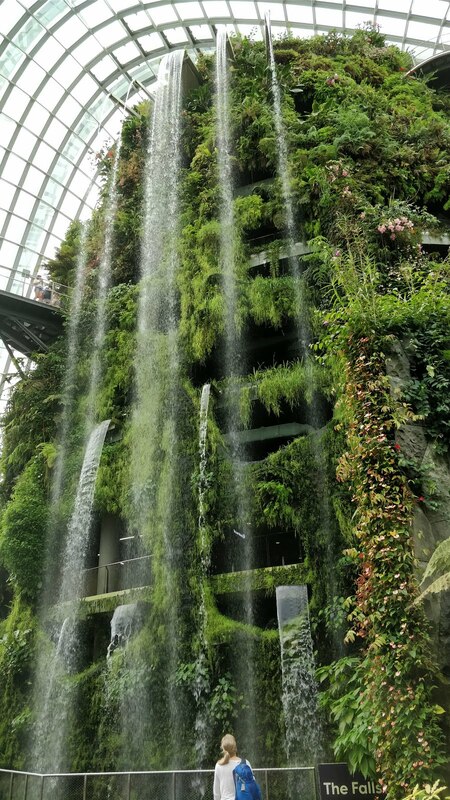 These are both huge greenhouses, first we went into the Cloud Forest and spent around 90 minutes in there exploring all 6 levels, but left a bit disappointed at the ‘Mist Show’, however the rest of it was fantastic. Next, we went into the Flower Dome, Sadie was looking forward to this as they had a ‘Tulipmania’ exhibition on, which is her favourite flower. I wasn’t that bothered about this one, however it was still a pretty good way to waste an hour or so, before we headed back to Boat Quay for happy hour drinks. After that, it was back over to Marina Bay Sands for their show, ‘Spectra’ which is a water/light show at the esplanade in front of the hotel. This was a 15-min display which was again impressive and free to watch too. After the show ended, we headed to a Korean BBQ place called I Am Kim Korean that was recommended to us by our fellow travellers Will & Fran who we met back in Nepal (seems like ages ago!). You pay a set fee per head, have a BBQ at your table and works on an all you can eat basis for 90 minutes. We got our money’s worth as we went up for endless meats, seafood, salads, sauces, soft drinks and some pre-cooked dishes too. You then cook as much as you can on the BBQ and they will come give you a clean grill if needed, we both left their feeling very stuffed and went back to the hotel, again after being out for another 12 hours or so. 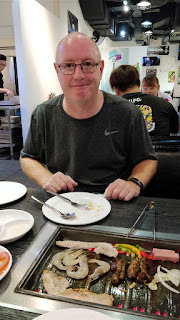 We had done a fair bit of what we wanted to see in Singapore by our last day, plus with the amount of walking we had done the previous couple of days, we had a lazy morning in the hotel and then headed up Orchard Road for brunch. This street is known for its shopping and restaurants, and I found a place called Wild Honey, which did their version of a full English. I picked that and Sadie had a scrambled egg dish with 2 types of steamed fish. Both plates were huge and delicious, they filled us right up (and after the shock of the cost of it), we headed out on a walk looking at various shops. With both of us now wanting to walk too much today, we decided to spend the late afternoon going to the cinema. After checking the listings, there was an Imax screen right near where we were that was showing the new Spielberg movie ‘Ready Player One’. I booked us tickets online and after going for a quick pint, we headed to the cinema. The film was better than I expected, and after that it was a quick visit to the Muslim quarter, where we did plan to eat but with both of us not feeling hungry, it was decided to head back to the hotel and pick up our laundry. There was a laundrette nearby, so after walking there and getting it all washed and dried, we picked a restaurant right next to our hotel to eat at on our last night in Singapore. And we weren’t disappointed as we got some fried chicken and sausage paratha, both delicious and cheap.